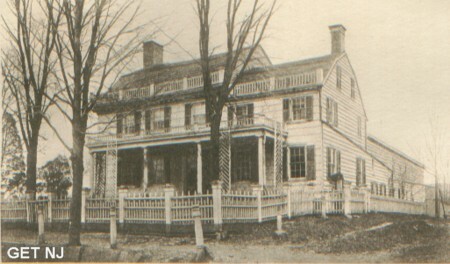 THE Burrowes Mansion, still standing in the picturesque village of Matawan,  noted for its old trees, old churches, and old dwelings,  is very much like the former Mount Pleasant Hall. They were both erected in the first half of the eighteenth century, and tradition says by the same architect, a native of Elizabethtown, whose name is lost to posterity. John Burrowes, or "Corn-King Burrowes," as he was sometimes called, became its owner a few years after its completion. He was a wealthy produce merchant with a line of vessels running between Keamy-Port and New York City. Back of the old mansion to-day one of his storehouses or granaries is an interesting village landmark. Out of its weather-beaten gray doors, in the long ago, his slaves would bring the bags of yellow grain and load the carts in the lane. The driver of the first cart would start his patient horses, and then the procession was off. Down the hilly, saffron-colored road from the house, winding serpentine to Keamy-Port, it would go until it reached a wharf where a clumsy white-sailed vessel was in readiness to bear it off to the markets of the distant city. The owner of the caravan always rode on horseback in the rear, and he was oftimes accompanied by his faithful wife and some of the children of that happy household. The first New Jersey company formed for the Revolutionary War was mustered in the garden of the Bur- rowes home. Its organizers were the son of the "Corn King," John Burrowes, Jr., appointed a major, and Jonathan Forman, who became his brother-in-law. The latter had just left the College of New Jersey and was not yet of age. Andrew Brown, an old sea captain, marshalled the large meeting of men, women, and children to take leave of fathers, brothers, husbands, and friends. The occasion was one of great solemnity, and was conducted with patriotic firmness and subdued grief. When the roll had been called the drum and fife struck up the air of " Duncan Davie," and the first New Jersey company marched away to embark for Long Island and join General Washington's forces. Many of John Burrowes's quaint old letters are in existence to-day, and they show him to have been a loving husband and father. A very interesting one to his wife, dated June 5, 1769, tells of his arriving at New York just before nightfall and finding all business suspended on account of the king's birthday. He wrote of "joy fires" burning along the streets, and "fine company moving abroad," but on every page he tells in words faded, but still, legible, of " yearnings" for the dear ones at Middleton. I again trouble you my dear Mrs. Burrowes with another epistle, tho' I know not whether you have rec' my last. I gave it to Ned Hammond last Monday who promised to send it by the first boat. The Packet is not yet arrived from London tho' it is ten weeks last Wednesday since she sailed (by the accounts in the Papers) My anxious heart forbodes a thousand ills for I know not whether Doctor Falck is not on board, so I am alarmed at his tedious passage. No doubt all is ordered for the best as : the Great first Cause rules over all, in all, and thro' all. I am so impatient to be again in the Inchanted Castle that (whether the Packet comes or not) I am determined to come back with Mrs. Brown the next frd' y.
I forgot to write you in my last that Mrs. Harrison my father's new wife is in town ; I just caught a glance of her yesterday in Queen Street,  as she walked past our door Miss Paty bid me look at my mother-in-law. She was drest like a girl of fifteen and the sight of her mortified me Prodigiously but I soon overcame it. Strange as it may seem to twentieth-century ears, reference to handsome houses as enchanted castles seems to have been quite in vogue in Mrs. Burrowes's day. Colonel Byrd, of Westover, writing of Governor Spotsood's house at Germanna, dubbed it the "Enchanted Castle," and Charles Pinckney and others of lesser renown have used it in their letters. Sad to relate, Mrs. Falck never took her impatiently awaited journey to the Burrowes enchanted castle, but sailed for England a few days after her letter arrived at Middletown-Point. There in later years she no doubt visited many castles, enchanted or otherwise, as her husband became a protege of Sir Clifton Wintringham, the Duchess of Kingston, and other London notables. In Mrs. Falck's letters to Mrs. Burrowes, bearing Revolutionary dates, there are references to new friends and acquaintances as "people of the first quality." Life in the Burrowes Mansion in the old days before the fateful year of 1776 was beautiful, and ran gayly,  almost as gayly as the little brook which sings to an army of young willow-trees in a valley close by the house. It was a household of romping young people, composed of one son and four daughters,  two of the latter bearing the Burrowes name and two the Watson name. Fortune smiled on them, and burnished their roof-tree with her golden horn. Many a score of slaves filled the cabins at the back of the lane. There were fine horses and coaches, fine jewels and dresses for the female portion of the family, brought by the sailing-vessels when returning from New York, fine liquors for the smiling punch-bowls, and, in fact, everything in connection with the family was fine, for they were one of the finest families of New Jersey. At the outbreak of the Revolution John Burrowes had been dealing largely in corn purchased from Monmouth farmers, and his many granaries were filled to overflowing. When the storm of the war burst in its fury, and there was a greater demand for than a supply of corn, all the Whig families in the vicinity looked to him for their needs, and he earned his title of "Corn-King Burrowes." Tory neighbors who had formerly been intimate with him naturally envied his good fortune. Much to his annoyance, they planned raids to his corn-bins, which generally proved futile, owing to the vigilance of friends. As the British gained entrance into Jersey these attacks became more and more frequent, and on one of them the tragedy occurred which gave the house its gruesome interest. Every year it is visited by a few roaming antiquarians, and as they mount the stairway, now slightly modernized, they always pause to wonder if the red spots on the boards are the blood-stains of young Mrs. Burrowes, who was stabbed for defying a band of redcoats. Mrs. Burrowes, nee Margaret Forman, one of Monmouth's Revolutionary martyrs, was the wife of Major John Burrowes, the only son of the "Corn King," and a sister of Mrs. Philip Freneau, the wife of the Revolutionary poet. Her marriage to Major Burrowes was the fifth marriage in the Burrowes family to be celebrated during the war, his sisters having been united to Dr. Henderson and Captain Forman, and his step-sisters, the Watson girls, to Colonel Holmes and General Stillwell. There was always the thought of long separation and the grimmer reflection of death for people of prominence who married in those troublous days, when foes were ever on the alert, but the old-time Jersey girls seem to have delighted in it. The greater the risk the more eager they seemed to join hands with those of their true loves, even though they bade them God-speed to the battle-field after the ceremony. There is a pretty and pathetic Monmouth tale told of a Freehold maid who married her soldier lover in her father's orchard, under boughs laden with snow-like blossoms. He left her side to march away with his regiment, vowing to return when the fruit was ripe. Not far from the orchard the great battle of Monmouth was fought, and he in the thick of the fight heard the final trumpet-call. The next day he was borne home to her through the orchard by some of his surviving comrades. It is said his blood stained the trees as he was carried along, and as a remembrance of the sweet vows they had heard, the fruit they afterwards bore was always circled with red, and the people of the vicinity named the apples "Monmouth reds." There is no knowing whether the Forman and Burrowes wedding was interrupted ; but most likely not, as it was celebrated very quietly. The Taylors and other Tory families of prominence in the neighborhood soon learned of it. Though spies were set upon the movements of the bridegroom with a view of capturing him, he successfully baffled them until some months afterwards, when they received the intelligence that he would visit his home. On that afternoon the Tories succeeded in getting word to the leader of "The Greens," an organized band of refugees on Staten Island, the terror of every Whig family for miles inland. They immediately crossed to the Jersey shore, and arrived on the road to the Burrowes Mansion shortly after midnight. We can picture the scene if we are at all familiar with the region. A June-time night, with a great full moon shining over the silent habitation lying by the road like some human thing with the breath of life gone out. The verdant foliage, so green at noonday, has a grayish tinge. The night's multitudinous voices have almost ceased, and even the yellow road seems white and merged into the landscape. Up the hilly road to the sleeping house the men from Staten Island come, but a friendly courier has been there a few moments before them, and Major Burrowes has escaped from a back window. Thinking the rebel safe in their net at last, the mob broke in the great front door and entered the house, led, so tradition says, by Broomfield, afterwards notorious at Fort Griswold. The family had been awakened by the courier's warning, and Mrs. Burrowes, clad only in her night-robe, with a shawl thrown about her shoulders, started to descend the stairway when the door fell in. A British officer was accidentally shot in the melee outside, and when the men entered the house, one of them, spying Mrs. Burrowes's shawl, demanded it to stanch his superior's wounds. "Never for such a purpose," she replied; and the soldier, infuriated, thrust his sabre into her breast, giving a wound which caused her death. Chagrined at the escape of Major Burrowes, and not content at his wife's suffering, the cry was raised to seize the "Corn King." He was bound and carried off to a prison-ship, and incarcerated for several months, but was eventually released through Dr. Henderson's efforts. The house was pillaged and the granaries and storehouses burned, but by a miracle the Mansion itself escaped. Although now unoccupied and neglected, it is in a fair state of preservation. Its exterior is little changed since the day Mrs. Falck longed to come back to her "enchanted castle," and John Burrowes sailed his line of vessels in and out of Kearny-Port, and wrote to his ,dear wife" from New York, Every time I sail away from you-even for a short time  I find my thoughts directed to my Jersey home and loved ones."